This incident is of my ancestral village in Gorakhpur. It was during the month of March-April, one of the ponds got dried up due to intolerable heat from the sun and the loo carried by hot winds. Well, this might sound weird but this sort of mid-summer atmospheric pressure is quiet common in North-western states of India and Uttar Pradesh is not an exception to this. As a result of the ponds drying up fastly & the water level dropping down rapidly, the fishes come to accumulate into the muddy water of the almost dry pond. This proves to be the best time for kids and other mud-fishing enthusiasts to fold up their sleeves and jump into this muddy water to catch few fishes for tonight's dinner. And to my disbelief, the outcome of mud-fishing is fruitful, atleast fruitful enough to be served as Fish fry, Fish curry or any other dish for that night's dinner. This lucky boy(see image above) along with his other mates caught up plenty of fish with his bare hands and expertise. 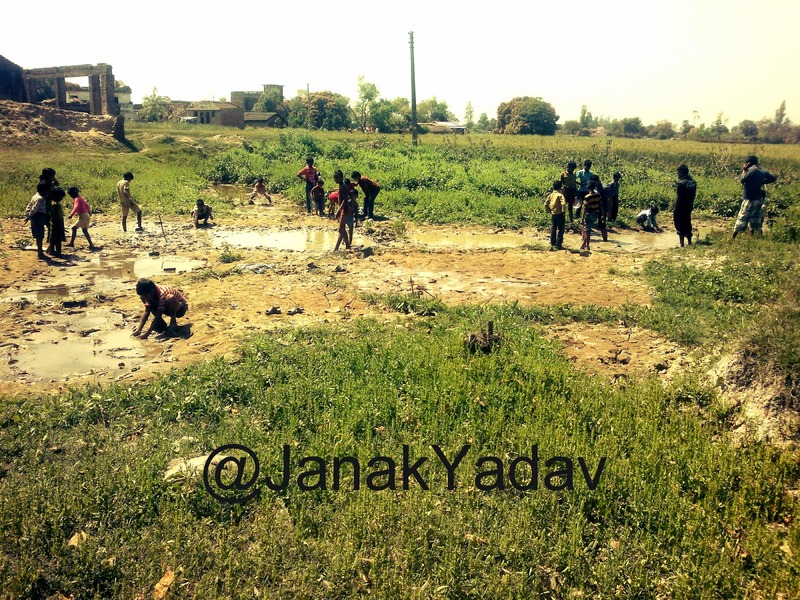 It fascinated me as if why I wasn't grown-up in my village to do let my hands-down for mud-fishing during Indian summer. Sigh! !